Prototype: German Federal Railroad (DB) type Bxf 796.1 S-Bahn cab control car, type ABx 791.1 S-Bahn car, 1st/2nd class, and type Bx 794.1 S-Bahn car, 2nd class. Paint scheme in the advertising design for Coca-Cola®. Use: S-Bahn trains Cologne-Düsseldorf around 1992. 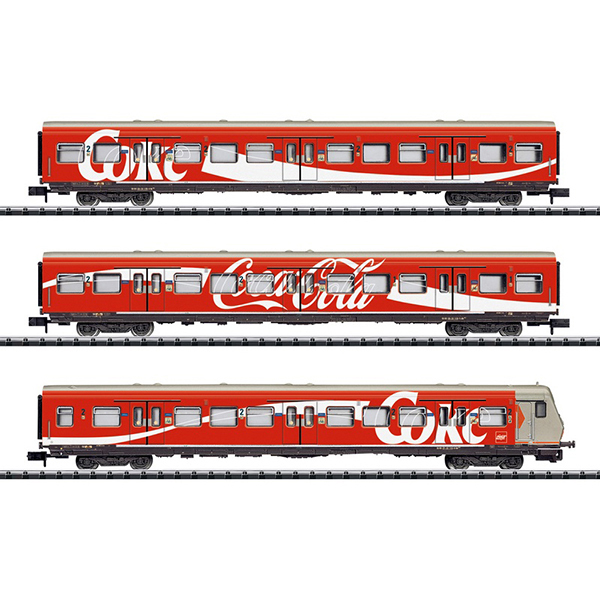 Model: The cab control car has white headlights and red marker lights at the cab end that change over with the direction of travel and will work in analog and digital operation. In digital operation, they can be controlled with the built-in DCC/SX function decoder. The cars have close coupler mechanisms. Interior lighting can be installed in the cars (cab control car excluded). Total length over the buffers 464 mm / 18-1/4".